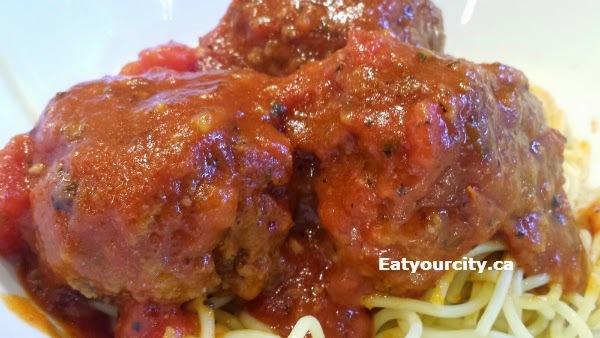 Eat Your City: Decadently moist gigantic meatballs with tomato sauce recipe! Decadently moist gigantic meatballs with tomato sauce recipe! -100% regular ground beef: not ideal as you'll have a lot of shrinkage as it cooks and you'll need to drain off a lot of water and grease... water is always added to ground beef, sorry folks! -Combination of beef and lamb: only if you plan not to serve to kids - they pick up on the gamey flavor of lamb like that! -75% ground turkey and 25% ground pork: 100% turkey is too dry on its own, pork is too bland on its own. Win-win! How to keep the meatballs from falling apart! An addition of an egg helps bind all the ingredients together. I try not to use any flour (my celiac friends wouldn't like that! ), but put in extra meat or less liquid instead. And don't skimp on the Parmesan cheese... as it cooks, it'll help bind the meat together. When searing, roll the meatball with a spoon and don't overcrowd the pan (although I always tend to hahaha!) so they have a less chance to smashing each other up.. rolling with a pair of chopsticks didn't work out all that well. How to keep them balls moist! You can use seasoned bread crumbs, diced up fresh rolls/bread, but lately, I've been sneaking in more fibre by using quick oats. They have to soak for a while in the marinade so they rehydrate (otherwise you get hard bits of uncooked oatmeal in them meatballs), and make sure you use quick oats used to make oatmeal. Don't use the thick steel-cut oats... the quick oats are flattened and cut super thin (unlike regular or steel cut oats) to cook quick and disappear into the meatball as it cooks! And feel free to add in some wine for flavor and moisture. Over the years, I've tried baking, pan sear and baking, cooking in the pan, baking and then cooking in sauce, baking in sauce, but the best method IMO, is: sear the meatballs and then finish cooking the meatballs by simmering them in tomato sauce. This way they retain moisture, pick up yummy flavor from the sear and get super moist since they don't have a chance to dry out while cooking! The baking in sauce was too inconsistent and sometimes the meatballs got too much moisture and just plain old fell apart. If you have time, go with a scratch tomato sauce, since you're spending time making meatballs from scratch. If not, season the bottled ready made stuff as I find the commercial sauces are always super acidic and sometimes so tangy and salty, they need a hit of sugar and butter to help balance things out. 1) In a large mixing bowl, combine everything but the ground beef, Parmesan, oil and tomato sauce. Let sit for 10-15 minutes so the oatmeal has a chance to rehydrate. 2) Mix in ground beef and Parmesan. Form into 8 meatballs, about the size of baseballs. 4) Once all meatballs are seared, dump in tomato sauce, bring to a simmer and cook, rolling the meatballs occasionally for another 10 minutes. Season the sauce to taste and serve with your favorite pasta.